After ninety minutes of football yesterday it was easy to see why Bognor Regis Town are contenders for a play-off spot and why they currently have the fourth best defensive record in the league (only Wealdstone, Margate and Lowestoft Town have conceeded fewer). The Rocks outplayed Town for large sections of the game playing some impressive skillful football passing the ball around very well. The home attacking force of Tyler Campbell, Adam Wallace, Scott McGleish and Liam Hope unable to cause their back line any real problems from open play as the visitors kept the ball well in the crucial midfield areas moving it forward to Harvey Whyte on the left wing on numerous occasions. 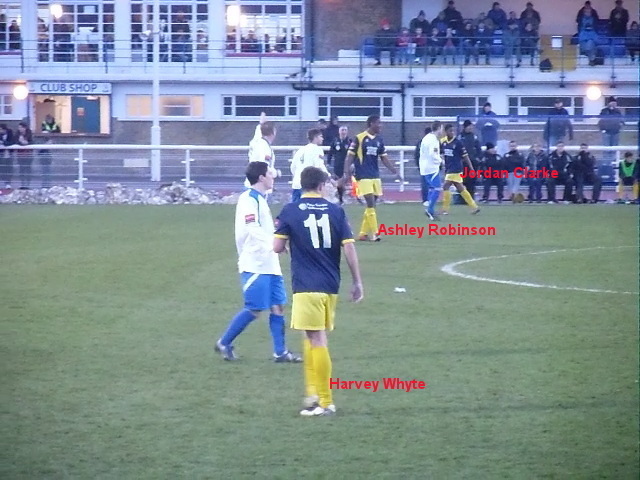 Whyte (number 11 in the video highlights), a recent signing from Blue Square South side Havant and Waterlooville, was the stand out player for TheColdEnd. Whenever the Rocks keeper had the ball and there was a chance of an attack they would revert to a 4-3-3 formation with winger's Whyte and Dan Beck taking very wide positions on the Town back four. (later Jordan Clarke when he came on as sub). When without the ball they played 4-4-2 with numbers behind the ball and worked well together. When Town had the ball attacking it was only McGleish and Wallace who were up-front with Campbell and especially Hope playing a deeper role in midfield. They were unable to get up and support in attack at that crucial stage. Above - The attacking options for both sides in the second half. The Rocks stretched the Enfield back line with Whyte and Clarke taking up very wide positions. Town looked more narrow with Wallace and McGleish close together and up against a very impressive defence. In fact Whyte spent most of the first half hugging the touchline on the right wing waiting to receive the ball and run into space causing the Town back line problems on numerous occasions. 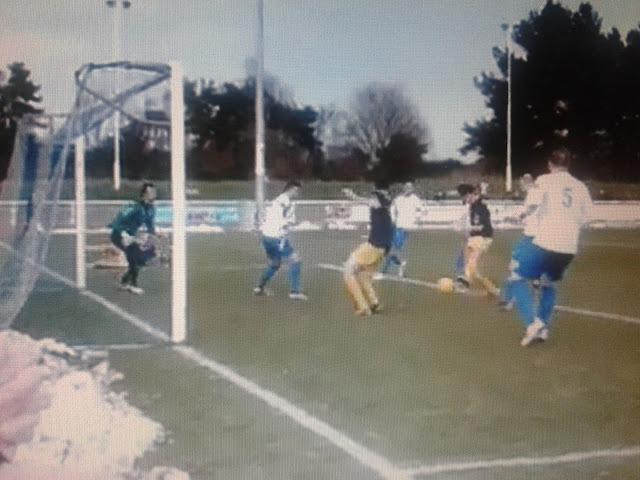 The Rock's goal came just prior to half time when James Crane touched home from close range following a break up field and cross into the box. The Town defender's appealed for an off-side decision to be made as they thought Crane was offside when he received the ball. Many Town fans also claimed that Crane was offside but as the below footage (shot by a Rock's fan) shows he was just about level when receiving the ball so it has to go down as an excellent decision by the Referee and his assistant. James Crane is on-side??? as the ball is played through to him to touch it into the net. Sorry about the picture quality but it's a still taken off the footage shot by a Rock's fan. See below for full footage of the goal from a different angle that TheColdEnd camera got. 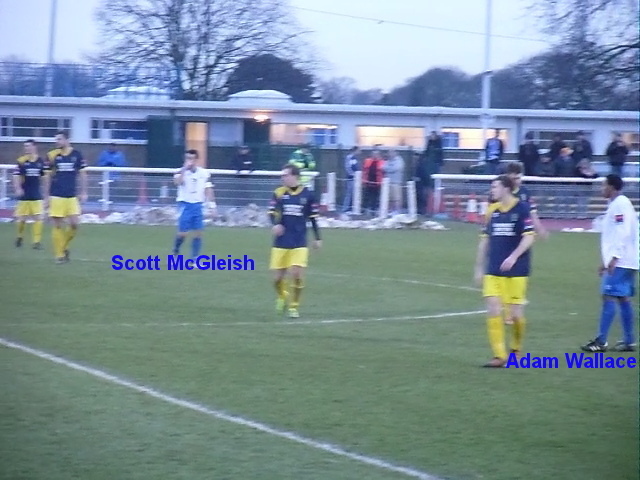 The below footage also shows the last action of the first half where after a corner Bognor had a shout for a penalty after the ball hit Adam Wallace's hand in the box. Ball to hand or Hand to ball? Kane Wills in central midfield also played very well and it looks to me as if he and Whyte could play at a higher level than the Ryman Premier Division. Wills is very comfortable on the ball, makes impressive forward runs, tracks back well, is aware of players around him and can pass the ball as well. Wills is a decent player and I would probably say one of the best midfield players in the Ryman League at this present time. It was reporting he apparently turned down a move to big spending Whitehawk to stay loyal to The Rocks. apologies for it not being in focus for Bognor hitting the post late on. Town did plug away and to their credit they were still in the game throughout. Their best chance came when Nick Jordan pulled off an amazing save from Liam Hope's header following a Jey Siva looping free kick. Talking of amazing saves it was Town keeper Noel Imber who was deservedly declared man of the match as he kept Town in the game with a string of impressive stops. So you can only say well done to Bognor Regis Town who fully deserved to take the three points back to Nyewood Lane. On this showing I am confident they will have a big say in the end of season play-offs. For Town and Steve Newing it's now two massive relegation six pointer away matches against Thurrock and Cray Wanderers. COME ON YOU TOWNERS!!! A quick word for the travelling support who were loud and supportive throughout the game. They certainly enjoyed their day-out at Donkey Lane. Finally, this game wouldn't of gone ahead if it weren't for the graft and hard work of Groundsman Jack Lucas and all the volunteers who helped shift the snow off the pitch. Well done people! !